If you purchase a “virgin” crank with the original “through holes” you will probably want to tap them out for 1/2-20 bolts. When I look at cranks that have been tapped, 90% have been butchered. You want the bolt face to sit flat on the flywheel! Your eye balls are NOT precision enough to ensure the drill is perpendicular to the flywheel flange. This jig consists of a 3/4 or 1″ plate with a precision bore. A step locator is used to locate the plate. 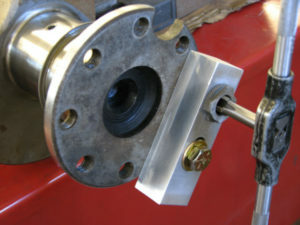 A bushing is then installed to ensure a perpendicular thread every time. The jig comes complete with aluminum plate, locator, bushing, 1/2-20 tap, hold-down bolt, tapping fluid and storage box. Components are “Made in USA”.